Looking for something fun to do in the Berkshires? 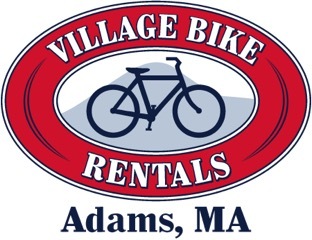 Rent bikes from Village Bike Rentals in Adams! We're located steps from the beginning of the Ashuwillticook Rail Trail, making it easy to get on the trail and get riding! Call us at 413-743-BIKE (2453) for more information and availability of bikes. We'll do everything we can to help make your ride on the trail as fun and as easy as it can be! Safe, comfortable bikes. Add-a-Bikes and Burley trailers also available. Reasonable rates, locks and helmets included, optional front-mounted baskets. Located at 31 Park Street in Adams, centrally located for your visit to the Berkshires. Free parking at the Discover the Berkshires Visitor Center. Paved, safe, and easy to ride. Outstanding views, abundant wildlife, and plenty of places to stop along the way. Contact us for more information and availability of bikes. We’ll do everything we can to help make your ride as fun and as easy as it can be! Drew, the proprietor, is a pleasure to work with and very accommodating! We rented two bikes as well as a Burley trailer, which our daughter loved. The shop is new and pleasant. The bikes are new and great quality. The trail, which begins practically at the shop, is beautiful and perfect for beginners, advanced bikers, children and adults alike. This is the place to go... get the best brand new bikes, at great prices and get very personalized service from the owner/operator. He is knowledgeable, helpful and very happy to go the extra mile to make sure you get not only what you want, but what you need to have an enjoyable experience. While visiting from the UK we rented three hybrid cycles that were ideal for a leisurely family trip along the scenic Ashuwillticook cycle trail. The proprietor could not have done more to ensure that we were equipped with all we needed to enjoy they day. The bikes were of high quality, clearly immaculately maintained, and the rate charged was very reasonable. Great friendly staff for picking best bike for each person. New comfortable bikes better than mine at home. Only a 10 second trip to get on the Ashuwillticook trail. Copyright © 2019 Village Bike Rentals. Powered by WordPress. Theme: Spacious by ThemeGrill.